Ilana Lapid is a filmmaker and educator interested in telling visual stories that put a human face on global conflicts. She was born in NYC and grew up in Jerusalem, Ottawa and Las Cruces, NM. She holds a BA from Yale and MFA from the University of Southern California in Film Production. Lapid received a Fulbright in Romania to work with visual stories of Roma (Gypsy) children, and was an Artist in Residence at Slifka Center at Yale. She has directed multiple short films that won awards at international festivals, including Red Mesa, which won Best Short at the LA Latino International Film Festival. Her short La Catrina is a selection of the 2016 Women in Film and Television International Showcase, and the binational 2016 Femme Frontera Filmmaker Showcase. Lapid is an Assistant Professor at the Creative Media Institute of New Mexico State University, where she teaches directing, screenwriting and border cinema. In 2013 and 2014 Lapid led a documentary filmmaking course in the jungle in Belize, which inspired her to write and direct Yochi. She is now working with Wildlife Conservation Society, other international NGOs, and the US Fish and Wildlife Service, to use Yochi for conservation education across the Caribbean. Lapid is currently working on a feature film based on Yochi, dealing with the illegal wildlife trade in Chiquibul jungle in Belize, bordering Guatemala. Craig Holden is a professional writer, novelist, teacher, editor and fundraiser. He is currently the Associate Director of Corporate and Foundation Relations for the New Mexico State University Foundation. In 2015, he collaborated with Buddy Ritter on an award winning non-fiction work about the history of Mesilla, New Mexico, called Mesilla Comes Alive. His sixth novel, Matala, was published by Simon & Schuster in 2008. He received his MFA in Fiction from the University of Montana in 1986, and then worked for two literary agencies in New York City, eventually becoming a film rights agent himself. His first novel, The River Sorrow, was translated into a dozen languages. His third novel, Four Corners of Night, received the Great Lakes Book Ward for fiction in 1999, and hit the USA Today bestseller list. His other novels include The Last Sanctuary (Delacorte, 1996), The Jazz Bird (Simon & Schuster, 2002) and The Narcissist's Daughter (Simon & Schuster, 2005). He has taught at the University of Toledo, the University of Michigan, and New Mexico State University. Currently he is nearing completion of his seventh novel and is involved in several film projects. Kristin Drexler-Britt is a full-time faculty of Human Ecology and Forestry at American Public University. Drexler is also a PhD student in Educational Leadership at New Mexico State University. She is currently producing a feature documentary with Film Shark Media about Yellow-Headed Parrots in Belize, Central America. In the late 90s’, Drexler served as a Peace Corps Volunteer in Belize. Returning there each year since, she and her husband consider Belize their second home. From 2006 to 2014, Drexler founded and directed the Belize Field School, a series of faculty-led academic courses with NMSU. Drexler recently produced a documentary filmmaking field course in Belize over two summers. Drexler continues her community development and education in Belize; she conducts community surveys as part of her faculty and doctoral research. Drexler serves on the board of directors for Full Basket Belize, a U.S. nonprofit, which provides scholarships and community grants in Belize. She currently assists on conservation projects including Yellow-Headed Parrot conservation education. Daniel Velazquez is a multi-media artist. He started working on film production in Belize in 1994 while in the US Peace Corps, promoting conservation projects for local and international broadcasts. In 1998, Velazquez worked on a National Geographic series called "Tales of Belize" produced by Emmy-award winning Carol and Richard Foster. In 2000, he started shooting video of the local Chicano art scene in Los Angeles, where he also shot anti-war movements and produced multi-media art exhibits. In 2003, Velazquez moved back to Belize to shoot, edit and produce wildlife conservation documentaries and collaborate in narrative film productions. In 2012, Velazquez began building Belize's first film industry, along with Canadian filmmaker Matthew Klinck, and produced Belize's first all-local cast and crew feature-length 2012 film Curse of the Xtabai. In 2013, Velazquez co-founded the Belize Documentary Film course series, along with Carol and Richard Foster, in coordination with Ilana Lapid and Kristi Drexler of New Mexico State University. Originally from Texas, Arran moved to Belize at a young age and has worked on a family ranch in Barton Creek, Cayo District. Arran has become the leading equestrian jungle guide in Belize, and has been featured in National Geographic and other international publications. Arran is an accomplished horseman and guide with extensive training in swift water, cave and jungle rescue and is certified as an Emergency Medical Technician (EMT) in Belize. Robert is a writer/director and cinematographer based out of Las Cruces and Albuquerque, New Mexico. At age 13 he fell ill for nearly half a year and discovered his intense obsession with filmmaking while lying in bed all day. He is a May 2016 graduate with a BA in Film at NMSU. He is especially interested in making films that shine a light on the difficult decisions people are driven to as a result of being marginalized. The humanist element of creating films that resonate with people is what drives his hunger to be a part of something bigger: to create films that have a positive effect on audiences the same way films have had a positive effect on him. Robert is currently in post-production on his independent short film, Zeal. Also an actor, Robert recently stars in the upcoming short film Flagging Mist. David is an editor and photographer based out of Albuquerque, New Mexico. He is continuously interested in making films that help bring to light complicated social issues in attempt to help better society and the world as a whole. He was Ilana Lapid’s editor for La Catrina which was selected for the 2016 Women in Film and Television International Showcase, and is still currently on the festival circuit. Many of his photographs have also gone on to receive awards and are featured on a number of online galleries. Jenn Garcia is an independent film producer born in Roswell, New Mexico. She is a May 2016 graduate with a B.B.A in Marketing and a B.A. in Film from New Mexico State University. In the past years she produced several ambitious short films, including Zeal, currently in post-production. She loves bringing people together and working with others to create beautiful works of art. She loves the collaborative environment film creates and works to make it a positive experience for everyone involved. She loves working on films that analyze human behavior and the way people interact with one another. Working with directors and watching their visions form into a reality is her favorite part of producing. Whitney Guaderrama is a filmmaker currently based in Las Cruces, New Mexico. She attends New Mexico State University studying Film and Theatre Arts. During her college career, she has worked on numerous short films and one feature film; most of which involved work in the art department. Whitney has always been drawn towards films that simply remind audiences of what it means to be human. She believes that cinema is a greatly influential way of storytelling and strives to help create visual narratives that receive strong emotional responses. Upon graduation in December 2016, Whitney hopes to travel and take her craft to other parts of the world, while continuing to meet and learn from other talented artists in film. AJ Johnson is a 20-year-old undergraduate student at New Mexico State University who is studying Theatre and Creative Media in Film. Her passion is to highlight the beauty of different perspectives between cultures and strives to open people's minds to experience the beauty of other people. AJ believes that opening one's mind and understanding others creates more opportunities for people to communicate, share traditions, and to essentially come together to save our earth. AJ strives to create an artistic team whose main purpose is to showcase the beauty and uniqueness in people and nature and share that with the rest of the world through film. Alison is a Texas native who has been living in Belize since 2001 with her husband Arran Bevis, co-managing the MET, a premier Eco-Jungle Lodge. She is passionate about wildlife and rainforest preservation, and the preserving of traditional remedies and ancient cultural knowledge. Alison studied art and design at Texas Tech University. She is a mother, a student, an artist, herbalist, a CMT, a homeschool teacher, and an entrepreneur. She has hosted History Channel, PBS, and other film groups while at MET. She did the Production Design (including wardrobe) and was the Script Supervisor for the filming of Yochi. Alison looks forward to being a part of the new and dynamic Belizean Film Industry. Nicholas was born in El Paso, Texas, and raised in Santa Teresa, New Mexico. He is a May 2016 college graduate from NMSU's Creative Media Institute with a degree in Digital Filmmaking. His main objective in life is to tell stories through art that includes acting, directing, sound design, musical writing and performance, and scoring for films. Music has always been his primary medium for storytelling. As a child he always gravitated towards musical instruments. When his parents purchased a piano for his sister, he ended up being the one who played it the most. In middle school he began learning how to play guitar and joined the middle school concert band as a percussionist. In the process of making films in college he learned more about the art of sound design and realized its potential to combine his love of music and films through composing. Alejandro is passionate about creating films that will make a lasting impact by captivating audiences and teaching them to better understand and love the world around them. After embarking on a documentary adventure in college with Ilana Lapid's Belize documentary course at NMSU, he felt the pull to return to the awe-inspiring country, and so he worked with ilana to develop the story for Yochi. Alejandro has been working to gain the experience necessary to create innovative and inspiring films aimed at providing the opportunity for audiences to explore the world through the screen. He has worked on countless sets for the past 8 years, learning and preparing for the chance to bring his dreams to life. His innate love for nature assists him in bringing the beauty and grandeur of remote places around the world to his audiences. The Fosters are Emmy Award-winning documentary filmmakers specializing in natural history and the environment. Working out of their jungle studio they have made films for the major networks including National Geographic and BBC. Living with the rain forests and the barrier reef on their door step, they have opportunities to find and film material not easily achieved by visiting filmmakers. They are currently using their skills to highlight the threats to the environment and nature by man and climate change -- subjects to which they are passionately committed. 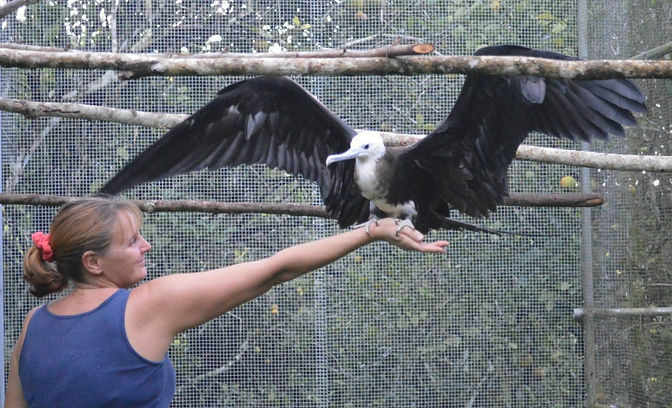 Nikki has been managing Belize Bird Rescue since its inception in 2004. Although the Centre works with every species of indeginous bird, her passion will always be for the parrots.